We can barely contain our excitement over the new feature we are working on and we want you to try it out! But first, let's tell you what it is. Currently, you can schedule your team's tasks in the team scheduler view and view your team's capacity in the team capacity view. We've now combined their superpowers into one! 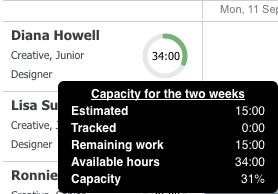 This means that while you are scheduling work you will also see your team's capacity update. Where do you find this wonderful tool? We've added a button to the current team scheduler, that will have a link to the updated team scheduler with capacity. For now, this will be available on beta and will only be live on Magnetic in a month or two, once we've updated the schedule view with more features. The Department and Position filters will determine the users for whom you want to schedule tasks. The additional filters will determine which tasks you want to view in the scheduler. The user's capacity will always be calculated for all their tasks, not only for the tasks viewed. If Include Overdue Tasks is selected, the scheduler will assume overdue tasks are due for today. If you want to exclude overdue tasks from the capacity, deselect the Include Overdue Tasks tick box. You can toggle to hide and show tasks or capacity, depending on what you would like to see for users. You can now schedule tasks according to your team's capacity to make sure you have the resources to get the job done on time. This feature is still a work in progress, so feel free to let us know if you have any suggestions or if something isn't working as expected. We'd love to hear what you think!